Disfruta de una auténtica aventura en el desierto en el corazón de Australia, mientras conduces un camello cerca de Alice Springs. Prepárate para un emocionante circuito de 1 hora por senderos de arena roja y senderos forestales; y divise canguros salvajes y canguros desde su exclusivo punto de vista. Finalmente, deténgase para una foto memorable en un contexto dramático de Western MacDonell Ranges. Observa canguros y canguros en su entorno natural. Elección de una salida por la tarde o al atardecer. This was one of the best things we've done in Australia. We did a sunset camel tour and saw a lot of wallabies while out on the camels. The views of the red desert and mcdonnell ranges is jaw dropping. The ranch has a hilarious talking parrot who says hello to you every time you walk past. I forgot to review this one as well, apparently. But our sunset camel ride was a total blast -- definitely a memorable experience and one of the highlights of our stay in Alice Springs. The camel ride was so much fun. Steve was great and took pictures of us at the perfect point of the ride. Our sunset ride was beautiful as the setting sun hit the mountain. Enjoyed seeing the young camel and the t talking cockatoo. Would definitely recommend this tour. Bus comes and picks you up from your accomodation. You are driven to the camel farm and one by one helped onto a camel. We travelled through the fields at sunset and enjoyed our ride. Possibly one thing that could be added is a cup of coffee/tea at the end of the night. I would definitely recommend doing the camel ride they are very well train and something different to do on your tour. 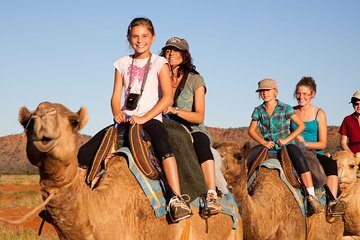 We really enjoyed this camel ride in the Aussie Outback. The staff was very friendly as well which made for an excellent experience. I must say that I was nervous but the owner alleviated all anxieties with the camels. Great tour, informative and fun. Sunset was the best.